It always feels like change happens when we’re not watching; like turning points pass unannounced, rendering us incapable of keeping up. We’re either overzealous in our anticipation, or we’re under-prepared, too late, holding out, while the shifts slink past with sneaky subtly. My past year has contained so many of these sneaky shifts, so many jerky transformations, and so many crossroads that I am ceasing to believe in crossroads altogether. Though the illusion is attractive, I’m not sure there is ever any straight, direct path to be sliced and divided. So far, my twenties are just a tangle of zigzags laid on top of each other, more intersection than section, with tens of turning points all spinning against one another like wheel spokes. 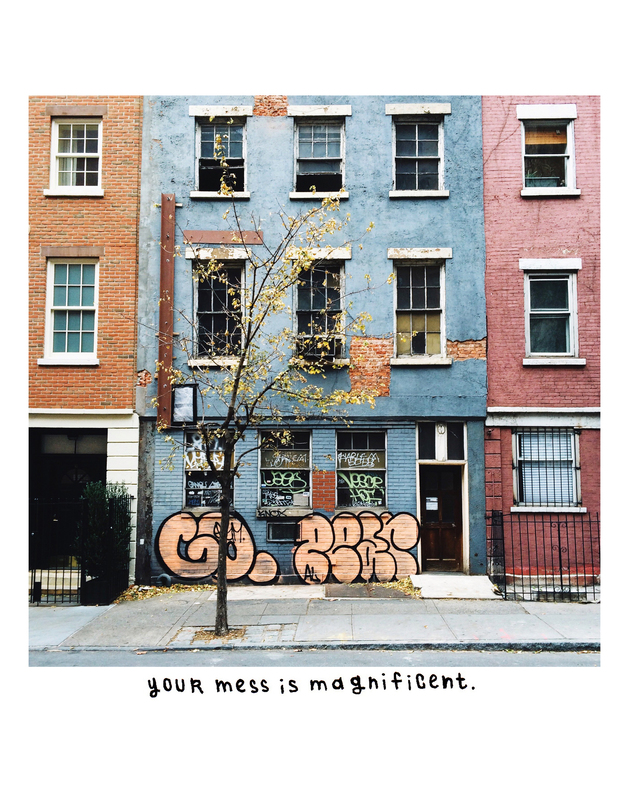 Life moves in messy jolts. Some changes, like seasons, are uncontrollable. Others rest on personal decisions. In the past few weeks, I’ve faced an unusual number of these transformative choices — the scary, complicated kind that tend to lead to late nights of scrawled pro-versus-con lists, yielding no resolutions except for a sore writing hand and a headache. Each potential redirection is a relished exercise in honing my heart-borne intuition, distilling the clear wisdom of gut instinct from the cloudy pulp of ego and earthly worry. “I just don’t want to let fear make up my mind,” I told my mom on the phone several weeks ago while trying to settle a particularly complicated internal conflict. This is always my worry: letting fear draw inauthentic, unproductive turning points into my journey. My freelance-focused, multi-job career affords perpetual piles of prospective opportunities as unwieldy as those heaps in the back of my closet. They’re crammed in layers on top of one another, difficult to sort. And in New York, the possibilities stack up taller than they might in any other place — this city is rife with ventures to attempt, people to meet, things to see and do and eat, and yet never enough money to confidently justify anything. The boundlessness can be overwhelming. And besides, she reminded me, you still get somewhere, even if it looks like a detour. You still experience something in that escape. Whether or not you’re running, whether or not you’re resisting change, change happens, and self-development happens in the process. Wherever you go or don’t go, you grow. I just returned from a five-day visit to New Orleans, where autumn’s force was negligible. The Louisiana air was steamy, hot and thick like soup. When I arrived on Tuesday morning at my Airbnb apartment in the Tremé neighborhood, I thought I had the address wrong. I saw the front porch cracked and caving, the windows sealed with black masking tape, the rusted nails jutting out from the rough wood panels, the paint more peeled than unpeeled, the door gently ajar like an open mouth — and I triple-checked the address on my phone. But this was it. My host was an actress with eyes like icy blue sequins against dark velvet, though her temperament oozed warmth. I greeted her and dropped my bags in my bedroom before leaving to wander. “What am I doing here?” I kept wondering. As my forehead dripped with sweat, I laughed sardonically at the thought of my missing beanie. I walked alone with the quiet purr of aged air conditioners and purring crickets and palm leaves rustling in the breeze, punctuated by the occasional train horn or rough bark of a pitbull — What am I doing here? I had foolishly expected the city to vibrate everywhere and always with the jostled rhythms of jazz, but the only constant pulse I felt was that question throbbing in my head: What am I doing here? What am I doing here? I had bought the plane ticket soon after finishing that phone call with my mom. It was a whim, really, funded by credit card rewards I’d saved up. It was the one choice that felt clear, though illogical. It was a controlled change — a change of pace, a change of scenery, a change of mindset, only for a few days. It was a decided detour. What I meant was, I don’t know. What I meant was, Running away. Both New York and New Orleans were built by runaways. They were settled by groups of newcomers who left home in search of new beginnings. The English conquered New York in 1664 and titled it in honor of their Duke of York. New Orleans was established by French colonists in 1718, dubbed for the French Duke of Orleans. Both cities were named for their newness. Both were founded on fresh starts. But both were based on old cultural heritage, with styles and customs borrowed from their originating countries. These hints of the past remain apparent. In New Orleans’ French Quarter, a handful of buildings still preserve their original colonial framework, though many more of the city’s structures date back to later historical eras in the 19th and 20th centuries. Without a tour guide, it was hard for me to tell what came from when — the whole city seemed like a mishmash of old and new. It felt like a quilt of recycled ends and starts. A celebration of crumbling and coming together, layer upon layer. A testament to the spinning spokes of change — the perpetual back-and-forth between holding on and letting go. On each day of my visit, I grew more familiar and more comfortable with the cloudy humidity; with the eerie quiet of my Airbnb neighborhood countered against the cacophony of nearby Bourbon Street; with the sour smell of oysters and spilled beer, softened by fried sweet dough; with the decadent dilapidation, rich in candy-colored mysticism. I slept late on most mornings and left midday for lunch and miles of walking. I ambled up and down different streets, in and out of stores and galleries, through parks. Usually, I found myself writing or reading at a cafe by sundown, then out alone for dinner, followed by a jazz show at one of countless local venues. I was inspired, intrigued, and content. Eventually, sweat-licked and tired, I made it back to my Airbnb rental, where I had the foreign luxury of a queen-sized bed. I slept on a diagonal, as if by habit, or perhaps I was subconsciously trying to figure out how to fill all of that extra space, so used to curling and contorting on my twin-sized mattress at home. Oddly, surprisingly, I missed it. There was something else I missed, too, though New Orleans offered everything I could consciously want from a city: art, music, food, and a vibrant creative culture. I liked its architecture’s choppy mix of old and new, too, and the prevalence of those crumbling buildings — an eccentric blend not unlike Brooklyn’s, whose quirky imperfection I find soothing. But something, still, was missing. I was surprised by how it felt — like I had dissociated from some part of myself. Like my heart wasn’t all there. Like I wasn’t wholly me. “Where are you from?” asked each waiter. “New York,” I answered, with increasing confidence as the week went on. “What are you doing here?” asked each cab driver. I’m a writer and an artist, amongst other things, I explained. But I’m taking a quick break. I’m refreshing my perspective. I’m checking out a different culture and a different creative community. I’m seeing what happens when I separate myself from a city whose rhythms are so entrenched in my being. I’m looking for what I might uncover when I relocate somewhere uncomfortably new. What I meant was, I’m here because I’m running. I’m running because I need to feel what it feels like to return home again. I’m escaping my head in an attempt to come closer to my heart. In college, I had four different homes: a dorm as a freshman, a high-rise apartment as a sophomore, a homestay in Paris and then an off-campus house as a junior, and a different off-campus house as a senior. In my first New York apartment after graduation, I barely lasted through a one-year lease. The impermanence of these rented spaces seemed to match my own state of teen-to-twentysomething transience. As I figuratively outgrew their walls, I moved out and moved on. Aside from my two childhood houses, my current apartment is the first place where I have ever lived for more than a year. I moved in at a particular turning point in my self-development, as I was leaving my full-time job and revolutionizing my health. During my 17 months in these rectangular walls, I have changed and matured more rapidly than ever before. And yet, here I still am – this again. Here we go again. Back to shivering under my sheets, just like last autumn, and as ready as never. Back to my tiny twin bed that barely fits my body. Cramped. Growing, but not going anywhere — at least, not as obviously as I’d like to be. I think that’s the subtle sign that change is happening, the hint we tend to miss — feeling cramped, though rarely in a conscious, tangible way we can pinpoint. When we sense that faint tension between old and new, between past and present, between where we are and where we want to go, we react in all sorts of ways. Sometimes, we choose to ignore the inklings; to dig our heels into the dirt; to hold onto our lushness and leave our hats and blankets stored in the closet. Sometimes, we run away in a totally different direction; we escape. But whatever we allow or resist, wherever we go or don’t go, we grow — again, and again, and again, in a tangle of zigzags laid on top of each other, with tens of turning points all spinning against one another like wheel spokes. I seem to relearn this lesson each season: that transformation moves in messy jolts, and that its patterns are cyclical. Every fall, in a violent blaze, the trees are forced to eventually yield to the chilled winds of change. They let go just to begin again in the spring, back where they started. “Where are you headed?” asked my cab driver as we drove away from my Airbnb, bound for the New Orleans airport. “You from there?” he asked. What I should have said, technically, was, No. Not originally. I’m from Maryland. What I said was, Yes. Because New York is home, still, for now. New York is where my heart is. New York is where my growth is. There is an electrifying joy I feel in New York that I have felt since I first arrived, even when it’s frigid cold, even when I’m contorting spiraled like a cinnamon bun in my bed too small for my body. New York, for me, is what’s hard, but important. What a beautiful and evocative essay! A very engaging read…makes me ponder on my own quest for self-discovery. Wow! You are so skillfully descriptive with your words that I felt as if I was walking through the streets of New Orleans with you!! It is interesting how our navigation through life can lead us around that 360 degrees circle and then right back to our starting point… back home to NYC and back to our familiar experience, frosty nights and all!! On the note of familiarity, I can totally relate to a chilly NYC apartment in early October!!! But as you so eloquently painted, it is in our exploration and adventures that we grow and move forward…now that’s rewarding! !